If a guide book was a riot, then this is it. 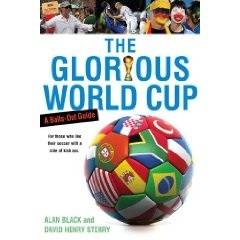 The Glorious World Cup is a smash and grab read with propellant laughs, and wicked satire. Expect some crunching tackles on the establishment with profiles on hooligans, World Cup villains and serious national grudges. Stuffed with country and player profiles, bags of footie history, and all you need to know about South Africa. Shooting on target are contributors Irvine Welsh, author of Trainspotting, best-selling author Po Bronson, and the world’s best soccer writer, Simon Kuper. This is the rebel guide for the soccer masses and the fanatic. Score one. *1 million condoms have recently been shipped to South Africa. *USA v England on June 12, the second day of the tournament, around the 60th anniversary of one of the World Cup’s most famous matches – USA’s shock 1-0 victory over England in the 1950 tournament in Brazil. *The first recorded soccer game in America took place at Plymouth Rock on what is now known as Thanksgiving. They used a pumpkin for a ball. *Henry Kissinger is soccer mad. Kobe Bryant too. The Glorious World Cup getting a very nice shout out from Washington Post: Original article. A fun yet informative guide to the World Cup, this inexpensive volume provides group match ups, player and country profiles, trivia, and brief histories to cups of the past. Generously illustrated, the book is ideal for reading on your flight to observe the World Cup firsthand-or for browsing between television viewings….a useful guide to casual or serious soccer fan.